Samuel Kelvin "Sammy" Peralta Sosa (born November 12, 1968) is a Dominican former professional baseball right fielder. Sosa played with four Major League Baseball teams over his career, most notably the Chicago Cubs. Sosa's Major League career began with the Texas Rangers in 1989. After three seasons with the Chicago White Sox, Sosa became a member of the Cubs in 1992 and became one of the league's best hitters. Sosa hit his 400th home run in his 1,354th game and his 5,273rd at-bat, the quickest in National League history. In 1998, Sosa and Mark McGwire achieved national fame for their home run-hitting prowess in pursuit of Roger Maris' home run record. 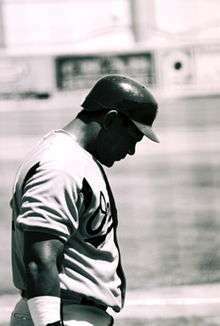 Sosa finished his career with brief stints with the Baltimore Orioles and the Texas Rangers. With the Rangers, Sosa hit his 600th career home run to become the fifth player in MLB history to reach the milestone. He is also the all-time home run leader among foreign-born MLB players. Sosa is one of only two National League players since 1900 to ever reach 160 RBIs in a season, a milestone he reached in 2001. Sosa is the only player to have hit 60 or more home runs in a single season three times. Sosa is known to family and friends as "Mikey." His maternal grandmother, who had suggested his birth name of Samuel, also came up with his nickname: "[She] heard the name on a soap opera she liked and decided from that moment on he would be Mikey." Sosa was born in the Dominican Republic. Though born in Consuelo, his officially registered birthplace is San Pedro de Macorís, which was "the largest town nearby." Both Consuelo and San Pedro de Macorís are in San Pedro de Macorís Province. Sosa made his major league debut on June 16, 1989, with the Texas Rangers, wearing #17 and leading off as the starting center fielder. He hit his first career home run off Roger Clemens. Later in the season, the Rangers traded Sammy to the Chicago White Sox where he would don the #25. In 1990, Sosa batted .233 with 15 home runs, 70 runs batted in, 10 triples, and 32 stolen bases. However, he also struck out 150 times, fourth most in the American League. 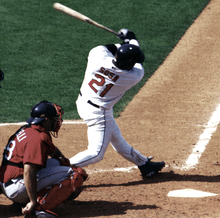 Sosa started the 1991 season by hitting 2 home runs and driving in 5 runs. However, he would slump for the rest of the year and ended up batting .203 with 10 home runs and 33 runs batted in. He was traded to the Chicago Cubs for outfielder George Bell before the 1992 season. In the 1999 season, Sosa hit 63 home runs, again trailing Mark McGwire who hit 65. In the 2000 season, Sammy led the league by hitting 50 home runs. He received the Babe Ruth Home Run Award for leading MLB in homers. Sosa in spring training with the Orioles in 2005. On January 28, 2005, the Cubs traded Sosa to the Baltimore Orioles in exchange for infielder/outfielder Jerry Hairston, Jr., infielder Mike Fontenot, and RHP Dave Crouthers. To facilitate the deal, Sosa and his agent agreed to waive the clause that guaranteed his 2006 salary, and the players' union indicated it would not object to that agreement. Under the deal, Sosa earned $17,875,000 for the 2005 season, with the Cubs paying $7 million of his salary. By playing for the 2005 Orioles alongside fellow 500-home-run batter Rafael Palmeiro, Sosa and Palmeiro became the first 500 home run club members in history to play together on the same team after reaching the 500 home run plateau. In 2005, The Sporting News published an update of their 1999 book Baseball's 100 Greatest Players. Sosa did not make the original edition, but for the 2005 update, with his career totals considerably higher, he was ranked at Number 95. During a stretch of nine consecutive years, Sosa hit 35+ home runs and 100+ RBIs, all with the Chicago Cubs. During this year, Sosa accompanied President Fernández of the Dominican Republic on several diplomatic trips including to the United States, Japan, and Taiwan. 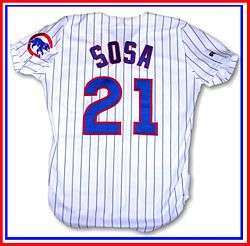 At the same time, the Chicago Cubs awarded Sosa's # 21 to new pitcher Jason Marquis, despite the fact that it was formerly worn by Sosa, who coincidentally later hit his 600th home run against Marquis. Ted Lilly, who had also signed with the Cubs that prior winter had requested #31 but was told it was not available as it was going to be retired for Greg Maddux and Fergie Jenkins, and they were just waiting for Maddux to retire. This caused some concern, due to Sosa's accomplishments with the Cubs, including his status as the Cubs' all-time home run leader. On June 16, 2009, the New York Times reported that Sosa supposedly was on a list of players who tested positive for performance-enhancing drugs in 2003. The paper did not identify the drug nor the source of the information. Sosa's agent, Adam Katz, told The Associated Press he had no comment on the report. Rich Levin, commissioner Bud Selig's office spokesman, declined to comment on the situation, claiming that MLB did not have a copy of the test results. Michael Weiner, the union general counsel, also declined comment. The union, while fighting to get the list back from the government, has mostly refused to discuss reports. Likewise, Sosa never admitted to using performance-enhancing drugs nor did he ever fail an MLB drug test throughout his professional career. Previously, Sosa sat alongside Rafael Palmeiro, Jose Canseco and Mark McGwire at a 2005 hearing before Congress. His attorney testified on his behalf, stating "To be clear, I have never taken illegal performance-enhancing drugs. I have never injected myself or had anyone inject me with anything. I have not broken the laws of the United States or the laws of the Dominican Republic. I have been tested as recently as 2004, and I am clean." In an interview with ESPN Deportes, Sosa said he would "calmly wait" for his induction into baseball's Hall of Fame, for which he became eligible in 2013. On January 9, 2013, Sosa was not elected by the Baseball Writers' Association of America (BBWAA) into baseball's Hall of Fame in Cooperstown, receiving 12.5% on his first year on the ballot (the requirement for election is 75%). For the elections of 2014 through 2016 he received 7.2%, 6.6%, and 7.0%. A candidate remains eligible for inclusion on subsequent ballots as long as they receive a minimum of 5.0% of the vote from the BBWAA. On October 2, 2016 at a press conference at Fenway Park, MLB Commissioner Rob Manfred said that the anonymous drug test in 2003 were inconclusive because "it was hard to distinguish between certain substances that were legal, available over the counter, and not banned under our program." Manfred argued that "it was important to make people understand that even if your name was on that list, that it was entirely possible that you were not a positive". Furthermore, Manfred sustained that the 2003 test were supposed to be confidential and it would be unfair to judge players based on "leaks, rumors, innuendo, [and] not confirmed positive test results". Manfred finished by stating that Hall of Fame voters should use their best judgment and only consider confirmed testing by the MLB as there were many "legitimate scientific questions about whether or not those were truly positives." Sosa is married to Sonia Rodríguez, a Dominican vedette, whom he has dated since 1986 and with whom he has four children: Keysha, Kenya, Sammy Jr., and Michael. The couple married by the Catholic Church on December 18, 2004, at Altos de Chavón, La Romana; they had already been married civilly for 12 years prior to the church wedding. 1 2 3 4 Sammy Sosa career stats. Baseball-Reference.com. Accessed 2007-06-05. ↑ Cunniff, Bill (1999-11-26). "Sosa plays host at party at his island mansion". Chicago Sun-Times. p. 3. Retrieved 2008-10-04. ↑ Hank Aaron reached 500 homers shortly after his teammate Eddie Mathews (512 homers) retired. ↑ T. R. Sullivan (January 17, 2007). Sosa, Rangers agree in principle to deal. MLB.com. Accessed 2007-06-05. ↑ DeLuca, Chris (February 22, 2007). "Sosa's 21 a long-distance number". Chicago Sun-Times. Archived from the original on September 30, 2007. Retrieved February 4, 2014. ↑ "Sosa not pursuing MLB job, says he intends to retire in 2009". ESPN.com. Retrieved 2008-10-03. ↑ Schmidt, Michael S. (June 17, 2009). "Sosa Is Said to Have Tested Positive in 2003". The New York Times. Retrieved April 10, 2010. ↑ McCann, Michael (2009-06-16). "Will steroids report lead to perjury investigation of Sammy Sosa?". Sports Illustrated. Retrieved 2009-06-18. ↑ Cruz, Héctor J. (7 June 2010). "Él también es un humano, no lo olviden" (in Spanish). Listín Diario. Note: The vedettes of the TV program "Sábado de Corporán" were known as "corporette". Archived from the original on 1 July 2016. Retrieved 1 July 2016. ↑ Mercedes, María (19 December 2004). "Sammy y Sonia confirman su amor ante Dios" (in Spanish). Casa de Campo, La Romana: Hoy. Archived from the original on 1 July 2016. Retrieved 1 July 2016.